If you've been turning pens, you'll have begun collecting odd sized drill bits. 27/64, 15/32, etc. Even the cheapie ones are $5 or more each. Last week I purchased a Navigator rollerball kit from Woodcraft. $10 for the kit, $6 for the bushings, and $35 for the two drill bits! $51 just to make a $10 kit. So I was standing there in front of the rack of expensive drill bits at Woodcraft when I noticed a box at the bottom. Drill bits in 64ths. A whole set. $25. I opened it to ensure it had the sizes I needed, and it did! I put the $35 pair of bits back on the rack and grabbed this bad boy. 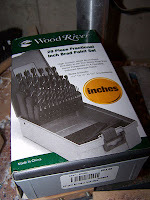 It's the Wood River 29 Piece Fractional Inch Brad Point Set. (Link here but it's $31.99 online.) I've been using them like mad this past week and loving it! Having all the odd sizes is great! For example, I was doing one of PSI's penlight kits that calls for a 1/2" hole. Well, 1/2" was a sloppy fit, so I went down to the next smaller size and the tube was a great fit! Grab one of these kits if you can. I'll be getting the metric one next.